Trimming a long stretch of hedge can be a tiring task involving uncomfortable working positions - and it can often be difficult to get close to the hedge with a machine. With its narrow dimensions, a Park Ranger 2150 fitted with a hedge trimmer gets close to the hedge to help you complete the task with ease. The hedge trimmer has a cutting height from 0-320 m so it can cut almost any height of hedge. It is perfect for trimming all kinds of hedges, including thuja, yew and tough beech hedges. The hedge trimmer can be adjusted hydraulically to cut either the top or side of the hedge. It provides maximum reach over broad hedges and can work on either side of the Park Ranger utility machine. The operator has an excellent view of the work area. The hedge trimmer is supported on four wheels and will give an evenly cut hedge, even when the ground is uneven. 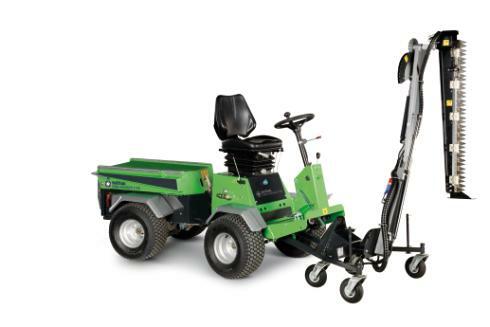 Park Ranger 2150 offers optimal manoeuvrability. This means that no matter if the hedges are planted straight or in curves, the result will always be top-class. With the Park Ranger 2150 the changeover from one attachment to another is done in less than 4 minutes - no tools required!